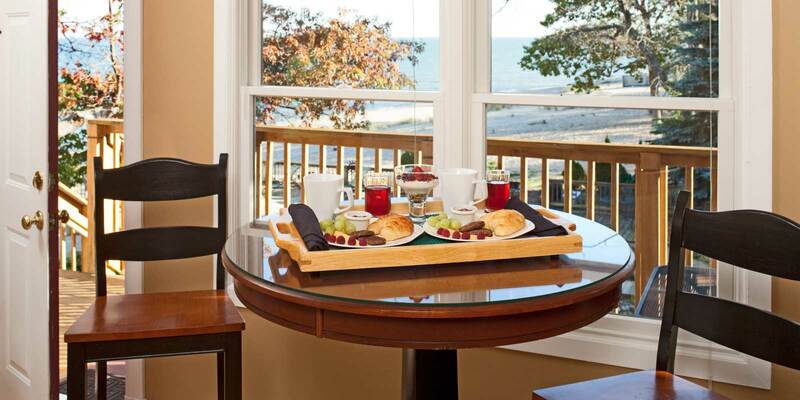 The Huron House can claim years of awards as a couples getaway — for example, a Top 10 Romantic Inn of Bed and Breakfast dot com and a top romantic destination of Midwest Living Magazine. It’s no wonder the awards and the five-star reviews keep piling up, and romance-minded couples return time after time. Breakfast is room-delivered at an agreed-on time. 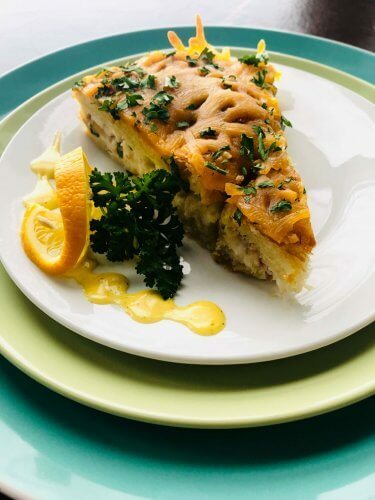 This dish is a smoked whitefish strata. The inn offers 14 king bed suites with fireplaces, in-room Jacuzzi tubs and private outdoor tubs plus views of Lake Huron. But that’s not all. Every room has: luxury linens, a private deck; candles; a breakfast nook with Keurig coffee machine, microwave, and mini-fridge; complimentary snacks; high-speed internet; flatscreen TVs with DVD player; media player with Netflix and Pandora, and your own controls for heat and air-conditioning. Breakfast is room-delivered at an agreed-on time. A room-delivered dessert comes in the evening. And then there’s the sand beach. 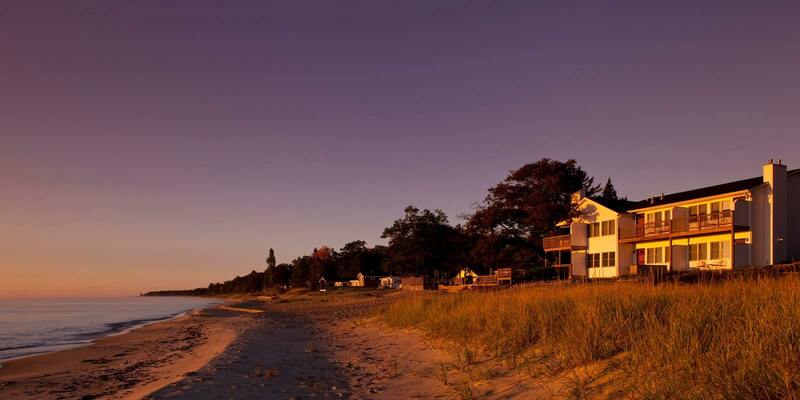 The Huron House is located on a beautiful stretch of Lake Huron between Tawas and Oscoda. Three hours from Detroit, a bit less from Traverse City, a bit more from Grand Rapids. Take a walk on miles of beautiful sand beach. Watch a sunrise or a full moon rise over Lake Huron. Binoculars are standard equipment in each room to watch Great Lakes freighters that move up and down the lake. Please see above. Check out the many add-ons and packages on our website, from roses and bubbly to massages, elopements or a photo session on the beach. Canoe or kayak the famed Au Sauble River, for a few miles or a lot of miles. Bring your fly rod to try your luck for trout — brook, brown or rainbow. As USA Today said in a recent article, “For many trout anglers, the Au Sable is the lodestone trout fishing destination.” Go west, and you can explore millions of acres of Huron National Forest. Golfers, take your pick of several golf courses, some with Lake Huron views or national forest vistas. Scottish design, parkland design, or recreational playability. Bring your clubs. 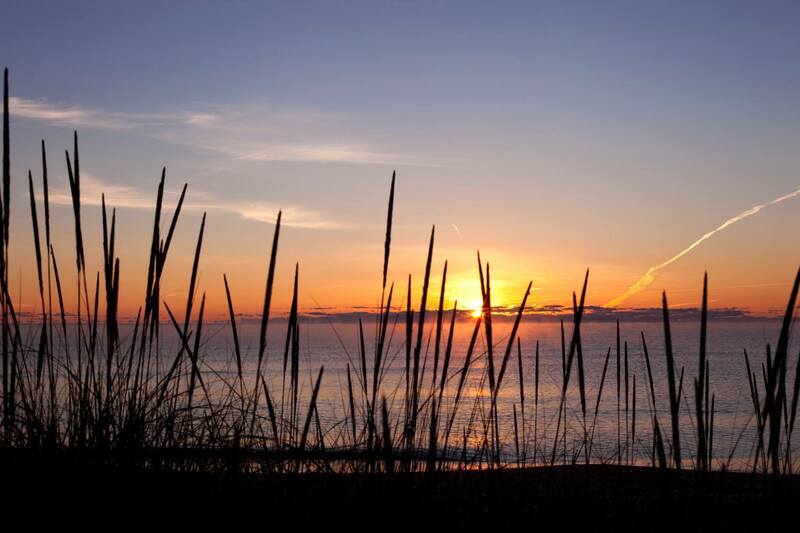 Get married at The Huron House in an intimate beach wedding ceremony for two on the romantic shores of Lake Huron. Just bring your loved one, your rings and your choice of wedding attire. We coordinate all the wedding details for this package. Our wedding officiant and our in-house witness can provide a legal ceremony with traditional or personalized wedding vows. Get one hour of professional photography, a bouquet for the bride and boutonniere for the groom, a sparkling beverage for the celebration toast, a wedding cake for two and chocolate covered strawberries. Also, enjoy a couples massage during your stay. Just minutes away, spend a day exploring the River Road National Scenic Byway, which parallels the mighty AuSable River. Overlooks on the Byway are located more than100 feet above the river and provide some of the most spectacular scenery in Northeast Michigan. The closest are at Tawas Point and Sturgeon Point. However, a day trip (90 minutes one way) will take you up to Forty Mile Point Lighthouse beyond Rogers City. On the list published by the Michigan Lighthouse Guide, you could check off six lights on land and two more if you can take a boat out of Alpena. Couples staying here when snow is on the ground can enjoy an exceptional combination of outdoor and indoor fun. The Corsair Ski Trails -- among the best trails in Michigan -- offer 44 miles of groomed trails. Cross-country ski rentals are available. Another idea: Ride fat tire bicycles on the groomed Eagle Fun Trails in nearby Huron National Forest. When you return to Huron House after your adventure in the snow, that’s when you’ll really appreciate our in-room fireplaces, jetted tubs, and private hot tubs.